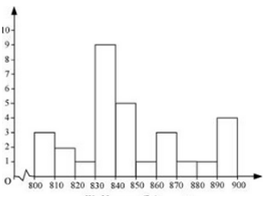 Q.1 For which of these would you use a histogram to show the data? (a) The number of letters for different areas in a postman’s bag. (b) The height of competitors in an athletics meet. (c) The number of cassettes produced by 5 companies. 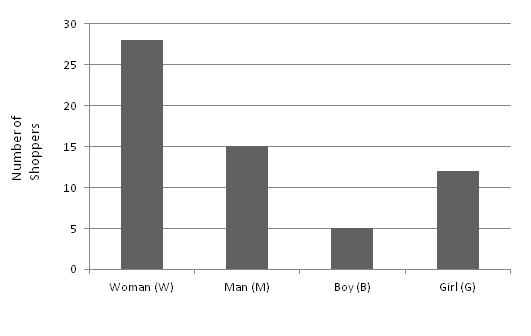 (d) The number of passengers boarding trains from 7:00 a.m. to 7:00 p.m. at a station. Sol. (a) In this case, we cannot use a histogram to show the data because the number of letters of different areas is unknown. So, we cannot define class intervals for this data. (b) In this case, we can use a histogram to the show data because we can divide the given data in class intervals. (c) In this case, we cannot use a histogram to show the data because the number of cassettes produced by 5 companies is unknown. (d) In this case, we can use a histogram to show the data because we can divide the given data in class intervals. So, we cannot define class intervals for this data. Make a frequency distribution table using tally marks. Draw a bar graph to illustrate it. Q.3 The weekly wages (in Rs) of 30 workers in a factory are. Using tally marks make a frequency table with intervals as 800–810, 810–820 and so on. Q.4 Draw a histogram for the frequency table made for the data in Question 3, and answer the following questions. (i) Which group has the maximum number of workers? (ii) How many workers earn Rs 850 and more? (iii) How many workers earn less than Rs 850? Sol. A histogram for the given data is as shown below: (i) It can be seen from the graph that the group 830 – 840 has the maximum number of workers. (ii) It can be seen from the graph that the there 10 workers who earn more than Rs 850. (iii) It can be seen from the graph that the there 20 workers who earn less than Rs 850. Q.5 . The number of hours for which students of a particular class watched television during holidays is shown through the given graph. Answer the following. (i) For how many hours did the maximum number of students watch TV? (ii) How many students watched TV for less than 4 hours? (iii) How many students spent more than 5 hours in watching TV? Sol. 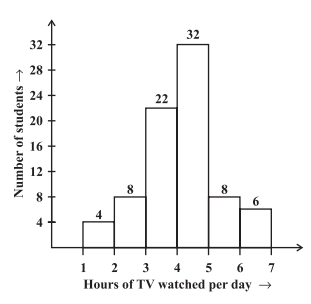 (i) It can be seen from the graph that for 4 – 5 hours the maximum number of students watched TV. (ii) It can be seen from the graph that 4 students watched TV for 1-2 hours, 8 students watched TV for 2-3 hours and 22 students watched TV for 3-4 hours. Hence, total number of students who watched TV for less than 4 hours = 4 + 8 + 22 = 34. (iii) It can be seen from the graph that 8 students watched TV for 5-6 hours and 6 students watched TV for 6-7 hours. Hence, total number of students who watched TV for more than 5 hours = 8 + 6 = 14.